Light the grill or heat the broiler. In a shallow dish, combine 4 tablespoons of the oil with the wine, 1/2 teaspoon of the salt, 1/4 teaspoon pepper, and the garlic. Add the veal chops and turn to coat. In a medium glass or stainless-steel bowl, combine the tomatoes with the remaining 1/4 teaspoon salt, the remaining 1 1/2 tablespoons oil, the herbs, vinegar, and a large pinch of pepper. Grill the chops over high heat or broil them for 4 to 5 minutes. Turn and cook until just done, 4 to 5 minutes longer. 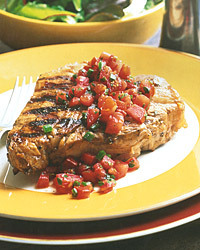 Serve the veal chops topped with the tomato sauce. Variation If you're in a rush or tomatoes are out of season, skip the tomato sauce. The chops are perfectly fine on their own. Don't bury the veal and its light sauce under a big, tannic wine. Dolcetto, with its fresh cherry and herb flavors and crisp, refreshing bite, is a much better choice.